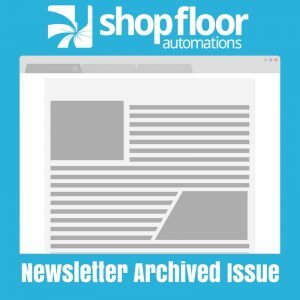 The following is an archived copy of our January/February 2015 Shop Floor Automations Newsletter. Since 1998, we’ve partnered with manufacturers and have now over 3,000 customers. SFA was recognized as Predator Software’s number #1 dealer for 2014. We are proud to receive this award for multiple years in a row. We stand by Predator Software, a U.S. made product. We listened to your requests and we are expanding! We now have a new regional office in Houston to better serve our customers. This presence in the Bayou City will enable us to provide more training, lower implementation costs and provide faster response times to nearby customers’ service requests. Are you looking to connect your CNC but frustrated with pinouts and soldiering of RS232 cables? We carry a variety of lengths, pre-made, terminated and ready to be shipped for any machine control. We have over 80 different configurations of pinouts to interface with any type of connect. All cables are manufactured in the U.S. and include a 5-year warranty. You can order online or call us anytime. Call (877) 611-5825 for more information on how we can help increase OEE and productivity. Our customers are at the heart of our business, and Gaby Ray in customer service is passionate about her role in making sure they are happy. If you’re already a customer, you may have spoken with her. Whether it is following up after a purchase or just seeing if there are any concerns, Gaby is here to help. We have a 99.5% satisfied customer rating based on our surveys and feedback. Gaby will be contacting you periodically to stay in touch, address your concerns or handle licensing needs. If you have any questions, please contact her directly at ext. 1008.